UDM Downloads > Convert OST Contacts to Outlook! Microsoft Exchange Server locally stores its data in OST file on your storage Device. Most commonly, the .pst files are used to store archived items & the .ost files to maintain off-line availability of the items. Want to get your OST files in PST file format? Convert OST Contacts to Outlook with Address Book Conversion tool. OST Contacts Conversion tool at SysTools is the best solution. Transferring OST Contacts to Outlook becomes easier with Exchange Address Book Conversion software. Software is a reliable tool to Convert OST Contacts to Outlook. Software easily converts OST Contacts to Comma Separated Value (CSV files) & Business Card (VCF files). Business Card allows you to import your OST contacts to MAC Address Book, Novell GroupWise, iPhone, iPod, iTunes, Outlook Express, ACT & other vCard compatible address book software. Software allows you to open OST contacts in Outlook, vCard & CSV file. Convert OST Contacts to Outlook provides user friendly interface. 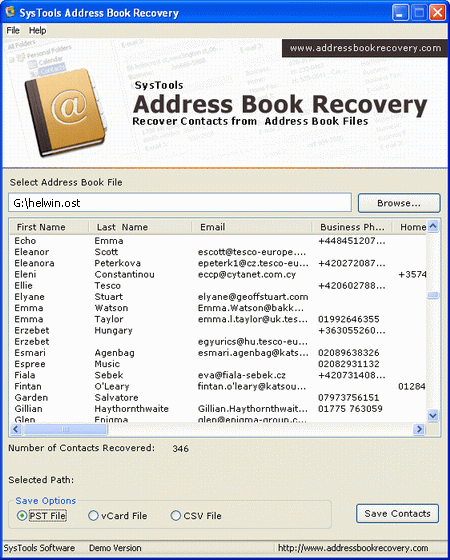 Exchange Address Book Conversion software requires MS Outlook & Exchange 97 or above to be installed in the computer systems to export OST contacts or Address Book to Outlook. It is portable, flexible & platform independent. Software successfully runs on Windows XP/2000/2003/Vista/7 OS. Download demo version for free & evaluate the software, some features has been disable from the trail version. To enjoy all the benefits of Convert OST Contacts to Outlook, purchase full license version at $49.